Disclosed herein is a dye composition comprising water in an amount greater than or equal to 40% by weight, relative to the total weight of the composition, and a process for dyeing keratin fibers, for example, human keratin fibers, using such a composition. This dye composition additionally comprise at least one dye chosen from oxidation dye precursors and direct dyes; at least one surfactant chosen from nonionic surfactants and anionic surfactants; at least one nonionic cellulose modified with at least one group comprising saturated and unsaturated, linear and branched C6-C30 hydrocarbon chains, and at least one cationic associative polymer. Also disclosed herein is a multi-compartment device or kit separately comprising the dye composition and an oxidizing composition. This application claims benefit of U.S. Provisional Application No. 60/681,151, filed May 16, 2005, the contents of which are incorporated herein by reference. This application also claims benefit of priority under 35 U.S.C. § 119 to French Patent Application No. FR 05 50842, filed Mar. 31, 2005, the contents of which are also incorporated herein by reference. Disclosed herein is a dye composition comprising at least one dye, at least one surfactant chosen from nonionic surfactants and anionic surfactants, at least one amphiphilic cellulose, at least one cationic associative polymer, wherein the dye composition comprises water in an amount greater than or equal to 40% by weight, relative to the total weight of the composition. Also disclosed herein is a process for dyeing keratin fibers, for example, human keratin fibers, using such a composition. Further disclosed herein is a multicompartment device or kit comprising the dye composition and an oxidizing composition comprising at least one oxidizing agent. There are essentially two types of dyeing of keratin fibers, for example,human keratin fibers, such as the hair. The first, called oxidation dyeing or permanent dyeing, involves using oxidation dye precursors, which are faintly colored or colorless substances. When they are exposed to an oxidizing agent, these compounds produce, through a process of oxidative condensation taking place inside the fiber, colored substances which remain trapped inside the fiber. The second, known as direct or semi-permanent dyeing, is obtained using colored and dye compounds having affinity with the keratin fibers to which they are applied. This type of dyeing does not require the use of an oxidizing agent to develop the color, although it is not impossible for this type of agent to be present during the process. The latter case is then referred to as direct color lightening. The dye compositions of known in the prior art are, in the majority of cases, in the form of liquids, gels or creams which are, if necessary, mixed, before applying to the fibers, with an oxidizing composition. The dye compositions aremay be relatively rich in raw materials, among which are usually fatty substances, surfactants and/or polymers. These compositions are typically formulated such that they exhibit spreading properties and textures which are easy to work with in order to allow easy and rapid application to the fibers, while being sufficiently thick so as not to run outside of the areas which it is desired to dye. Furthermore, these compositions should remain stable during the leave-in time on the fibers and should be easy to remove on rinsing once the color has been obtained. Large quantities of raw materials may affect the dyeing performance of such compositions. It is thus possible to observe a less favorable kinetics, a reduced intensity of the shade obtained, a less satisfactory homogeneity of the color from one fiber to another and/or according to the position on the fiber (root/end), and the like. Disclosed herein are dye compositions which avoid at least one of the abovementioned disadvantages of current dye compositions, while preserving at least one of the properties mentioned above. wherein the composition comprises water in an amount greater than or equal to 40% by weight relative to the total weight of the composition. Also disclosed herein is a process for dyeing keratin fibers using such a composition, and, in some embodiments, in the presence of an oxidizing composition. Further disclosed herein is a device comprising a first compartment comprising a dye composition according to the disclosure and a second compartment comprising an oxidizing composition. The composition according to the disclosure may cause less deterioration of the dyeing properties and may make it possible to obtain colors which are more intense, more homogeneous and more chromatic, while conferring good cosmetic properties on the treated fibers and while limiting their deterioration. The compositions disclosed herein may have an ideal texture for use in dyeing human keratin fibers, for example, the hair. They may be unctuous, sufficiently thick for rapid and easy application, with good removal upon rinsing, without as a result running outside the areas of the hair which it is desired to treat. Other characteristics and benefits of the present disclosure will emerge more clearly upon reading the description and the example which follow. In the text below, and unless otherwise stated, it is specified that the limits of the ranges of values are included in these ranges. When reference is made herein to a compound with a fatty chain, this chain is a saturated or unsaturated, linear or branched hydrocarbon chain comprising from 8 to 30 carbon atoms, for example, from 10 to 24 carbon atoms. As discussed above, the composition disclosed herein present is appropriate for dyeing keratin fibers, for example, human keratin fibers, further, for example, the hair. The dye composition disclosed herein comprises water in an amount greater than or equal to 40% by weight, relative to the total weight of the dye composition. According to one embodiment, the dye composition disclosed herein comprises water in an amount greater than or equal to 45% by weight, relative to the total weight of the dye composition. According to another embodiment, the dye composition disclosed herein comprises water in an amount greater than or equal to 50% by weight, relative to the total weight of the dye composition. The composition disclosed herein comprises at least one surfactant chosen from nonionic surfactants and anionic surfactants. In at least one embodiment, the mean number of oxyalkylenated units may range from 2 to 150 units. In at least one further embodiment, they are oxyethylenated or oxypropylenated units, or mixtures thereof. The glycerolated surfactants may comprise on average 1 to 20 glycerol groups, for example, 1.5 to 5. According to one embodiment, the composition comprises at least one nonionic surfactant chosen from oxyalkylenated or glycerolated C6-C30 alcohols. In at least one embodiment, the anionic surfactants may be in the form of salts in the composition disclosed herein, for example, salts of alkali metals, for instance sodium; salts of alkaline-earth metals, for instance magnesium; ammonium salts; amine salts; and amino alcohol salts. Depending on the conditions, the anionic surfactants may also be in the acid form thereof. It should be noted that the alkyl or acyl radicals of these various compounds may comprise, for example, from 12 to 20 carbon atoms. In at least one embodiment, the aryl radical is chosen from a phenyl groups and benzyl groups. Furthermore, the polyoxyalkylenated anionic surfactants may comprise from 2 to 50 alkylene, for example, ethylene, oxide groups. According to one embodiment, the anionic surfactant is chosen from the salts of fatty acids. In at least one embodiment the at least one surfactant chosen from nonionic and anionic surfactants is present in an amount ranging from 0.01% to 50% by weight, such as from 0.5% to 40% by weight, relative to the total weight of the composition. The composition disclosed herein additionally comprises at least one nonionic cellulose modified with at least one group chosen from saturated and unsaturated, linear and branched C6-C30 hydrocarbon chains. In one embodiment, the modified nonionic cellulose is chosen from hydroxy(C2-C3)alkylcelluloses modified with at least one group chosen from saturated and unsaturated, linear and branched C6-C30 hydrocarbon chains, such as for example C6-C30, for example, C8-C22, alkyl, aralkyl or alkylaryl chains. Also suitable are the hydroxy(C2-C3)alkylcelluloses modified with polyalkylene glycol alkylphenol ether groups. As examples of such celluloses, there may be mentioned, with no limitation being implied, modified hydroxyethylcelluloses such as the compounds Natrosol Plus Grade 330 CS 15 bearing C16 alkyl chains (marketed by the company Aqualon); Bermocoll EHM 100 (marketed by the company Berol Nobel); Amercell Polymer HM1500 (hydroxyethylcellulose modified with a polyethylene glycol (15) nonylphenol ether—marketed by the company Amerchol). As discussed above, the composition disclosed herein comprises at least one cationic associative polymer. The at least one cationic associative polymer is characterized by the presence of hydrophilic regions which bring about the solubility in water, and hydrophobic regions through which the polymers, in an aqueous medium, assemble together or with the hydrophobic parts of other molecules. Such polymers are also capable, in an aqueous medium, of reversibly combining with each other or with other molecules. In at least one embodiment, the at least one cationic associative polymer may be chosen from amphiphilic polymers comprising at least one fatty chain. As used herein, “polymer” means compounds exhibiting, in their structure, the repeat of at least one linkage other than the ethylene oxide or propylene oxide or glycerol linkage if this type of linkage is present. In at least one embodiment, the at least one cationic associative polymer may be chosen from quaternized cellulose derivatives, cationic polyurethanes, cationic polyvinyllactams and cationic acrylic terpolymers, wherein these compounds comprise at least one fatty chain. quaternized hydroxyethylcelluloses modified with groups comprising at least one fatty chain, such as alkyl, arylalkyl or alkylaryl groups, for example, comprising at least 8 carbon atoms, or mixtures thereof. The alkyl radicals carried by the above quaternized celluloses or hydroxyethylcelluloses may, for example, comprise from 8 to 30 carbon atoms. The aryl radicals may be chosen, for example, from phenyl, benzyl, naphthyl and anthryl groups. Non-limiting mention may be made, as examples of quaternized alkylhydroxyethylcelluloses with C8-C30 fatty chains, the products QUATRISOFT LM 200, QUATRISOFT LM-X 529-18-A, QUATRISOFT LM-X 529-18B (C12 alkyl) and QUATRISOFT LM-X 529-8 (C18 alkyl) marketed by the company AMERCHOL and the products CRODACEL QM, CRODACEL QL (C12 alkyl) and CRODACEL QS (C18 alkyl) marketed by the company CRODA. wherein the molecule comprises at least one protonated or quaternized amine functional group and at least one hydrophobic group. These compounds have been described in European Patent Application No. EP1 174 450. In at least one embodiment, the only hydrophobic groups are the groups R and R′ at the chain ends. L, L′, L″, P, P′, Y and m have the meaning disclosed above. L, L′, L″, Y and m have the meaning disclosed above. When n and p are equal to 0, these polymers do not comprise units derived from a monomer comprising an amine functional group, incorporated into the polymer during polycondensation. The protonated amine functional groups of these polyurethanes result from the hydrolysis of isocyanate functional groups, in excess, at the chain end, followed by alkylation of the primary amine functional groups formed by alkylating agents comprising a hydrophobic group, that is to say compounds of the RQ or R′Q type, wherein R and R′ are as defined above and Q is chosen from a leaving group such as a halide, a sulphate and the like. L, L′, Y and m have the meaning disclosed above. The number-average molecular mass of the cationic amphiphilic polyurethanes may range from 400 to 500,000, for example, from 1,000 to 400,000, and further, for example, from 1,000 to 300,000. As used herein, “hydrophobic group” is understood to mean a radical or polymer comprising a saturated or unsaturated, linear or branched hydrocarbon chain comprising at least one heteroatom such as P, O, N, S or radicals comprising a perfluorinated or silicone chain. When the hydrophobic group is chosen from a hydrocarbon radical, the hydrophobic group comprises at least 10 carbon atoms, such as from 10 to 30 carbon atoms, for example, from 12 to 30 carbon atoms, and further, for example, from 18 to 30 carbon atoms. In one embodiment, the hydrocarbon group may be derived from a monofunctional compound. In another embodiment, the hydrophobic group may be derived from a fatty alcohol such as stearyl alcohol, dodecyl alcohol, decyl alcohol. It may also be chosen from hydrocarbon polymers such as polybutadiene. A− is a physiologically acceptable counterion. R4 is chosen from linear or branched alkylene radicals having from 1 to 20 carbon atoms, comprising a saturated or unsaturated ring; arylene radicals, wherein at least one of the carbon atoms may be optionally replaced by a heteroatom chosen from N, S, O, and P.
and A− is a physiologically acceptable counterion. In Y, “hydrophilic group” understood to mean a polymeric or nonpolymeric water-soluble group. In one embodiment, Y, when polymers are not involved, may be chosen from ethylene glycol, diethylene glycol and propylene glycol. In one embodiment, when a hydrophilic polymer is present in the composition disclosed herein, Y may be chosen, for example, from polyethers, sulphonated polyesters, sulphonated polyamides, or a mixture of these polymers. In another embodiment, the hydrophilic compound is a polyether, for example, a polyethylene oxide or a polypropylene oxide. The hydrophilic group noted Y in formula (Ia) is optional. In one embodiment, the units comprising quaternary or protonated amine functional groups may suffice to provide the solubility or water-dispersibility necessary for this type of polymer in an aqueous solution. Although the presence of a hydrophilic group Y is optional, in one embodiment, cationic amphiphilic polyurethanes may comprise group Y. Said cationic amphiphilic polyurethanes may be water-soluble or water-dispersible. In one embodiment, the associative cationic poly(vinyllactam)polymers may be crosslinked or noncrosslinked and may also be block polymers. In another embodiment, the counterion Z− of the monomers of formula (Ib) is chosen from halide ions, phosphate ions, methosulphate ions, and tosylate ions. In one embodiment, R3, R4 and R5, which may be identical or different, are each chosen from hydrogen atoms and linear or branched C1-C30 alkyl radicals. In one embodiment, the monomer b) is a monomer of formula (Ib) wherein m and n are equal to zero. provided that at least one of the radicals R9 and R10 is chosen from a hydrogen atom. In one embodiment, the monomer (IVb) is vinylpyrrolidone. The cationic poly(vinyllactam) polymers may also comprise at least one additional, for example, cationic or nonionic, monomers. c)—one monomer of formula (IIb) wherein R3 and R4, which may be identical or different, are each chosen from hydrogen atoms and C1-C5 alkyl radicals. In another embodiment, the terpolymers are present in the composition disclosed herein in an amount ranging from, by weight, 40 to 95% of monomer (a), 0.1 to 55% of monomer (c) and 0.25 to 50% of monomer (b). Such polymers are described in International Patent Application No. WO-00/68282 which is incorporated herein in full. In one embodiment, the cationic poly(vinyllactam)polymers are chosen from the terpolymers vinylpyrrolidone/dimethylaminopropylmethacrylamide/dodecyldimethylmethacrylamidopropylammonium tosylate, the terpolymers vinylpyrrolidone/dimethylaminopropylmethacrylamide/cocoyldimethylmethacrylamidopropylammonium tosylate, the terpolymers vinylpyrrolidone/dimethylaminopropylmethacrylamide/-lauryldimethylmethacrylamidopropylammonium tosylate or chloride. The weight-average molecular mass of the associative cationic poly(vinyllactam) polymers disclosed herein ranges from 500 to 20×106, for example, from 200,000 to 2×106 and further, for example, from 400,000 to 800,000.
from 0.1 to 30% by weight, for example, from 0.1 to 10% by weight of a monomer (c) chosen from (i) a urethane produced by the reaction between a monoethylenic unsaturated isocyanate and a nonionic surfactant with a C1-C4 alkoxy end; (ii) a 1,2-butylene oxide and 1,2-ethylene oxide block copolymer; (iii) a copolymerizable ethylenic unsaturated surfactant monomer obtained by condensation of a nonionic surfactant with an α,β-ethylenic unsaturated carboxylic acid or its anhydride; (iv) a surfactant monomer chosen from products of reaction of the urea type of a monoethylenic unsaturated monoisocyanate with a nonionic surfactant having an amine functional group; (v) a (meth)allyl ether of formula CH2is C1, CH2OAmBnApR2 wherein R1 is chosen from hydrogen atoms and methyl groups, A is chosen from propyleneoxy and butyleneoxy groups, B is chosen from ethyleneoxy, n chosen from a number less than or equal to 200, for example, less than 100, m and p are chosen from a number less than n and R2 is a hydrophobic group of at least 8 carbon atoms, for example, C8-C30; and (vi) a nonionic monomer of the urethane type produced by the reaction of a monohydric nonionic surfactant with a monoethylenic unsaturated isocyanate; the percentages by weight of monomers being based on the total weight of the monomers constituting the terpolymer. In one embodiment, acrylate monomers (a) comprise, for example, C2-C6 alkyl acrylates. Ethyl acrylate may be used in one embodiment. In one embodiment, monomers (b) may be chosen from N,N-dimethylaminoethyl methacrylate (DMAEMA), N,N-diethylaminoethyl acrylate, N,N-diethylaminoethyl methacrylate, N-t-butylaminoethyl acrylate, N-t-butylaminoethyl methacrylate, N,N-dimethylaminopropylacrylamide, N,N-dimethylaminopropyl-methacrylamide, N,N-diethylaminopropylacrylamide and N,N-diethylaminopropyl-methacrylamide. 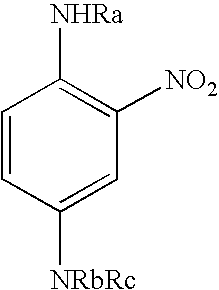 N,N-dimethylaminoethyl methacrylate may be used in one embodiment. In one embodiment, monomers (c) are chosen from the copolymerizable ethylenic unsaturated surfactant monomers obtained by condensation of a nonionic surfactant with an α,β-unsaturated carboxylic acid or its anhydride, for example, C3-C4 mono- or dicarboxylic acids or their anhydrides and further, for example, acrylic acid, methacrylic acid, crotonic acid, maleic acid, maleic anhydride and even further, for example, itaconic acid and itaconic anhydride. In another embodiment, monomers (c) are chosen from the copolymerizable ethylenic unsaturated surfactant monomers obtained by condensation of a nonionic surfactant with itaconic acid. Among the nonionic surfactants, there may be mentioned, for example, alkoxylated C10-C30 fatty alcohols with 2 to 100, for example, from 5 to 50 moles of alkylene oxide, such as for example ethers of polyethylene glycol and C10-C30 fatty alcohols and, for example, ethers of polyethylene glycol and cetyl alcohol, called CETETH in the CTFA dictionary, 7th edition, 1997. Conventional methods for preparing these acrylic terpolymers are known to a person skilled in the art. Such methods include solution polymerization, precipitation polymerization and emulsion polymerization. Terpolymers in accordance with the disclosure and their methods of preparation are described, for example, in European Patent Application Nos. EP-A-0824914 and EP-A-0825200. In one embodiment, the terpolymer may be chosen from the polymer “STRUCTURE® PLUS” sold by the company NATIONAL STARCH, which comprise polyoxyethylenated C10-C30 alkyl acrylates, amino(meth)acrylates and itaconate comprising 20 moles of ethylene oxide in the form of an aqueous dispersion comprising 20% of Active Substance. In addition to these monomers, the terpolymers may contain other monomers which make it possible to crosslink said terpolymers. These monomers are used in fairly low proportions, up to 2% by weight relative to the total weight of the monomers used to prepare the terpolymers. Such crosslinking monomers comprise aromatic monomers bearing several vinyl substituents, alicyclic monomers bearing several vinyl substituents, bifunctional esters of phthalic acid, bifunctional esters of methacrylic acid, multifunctional esters of acrylic acid, N-methylenebisacrylamide and aliphatic monomers bearing several vinyl substituents such as dienes, trienes and tetraenes. Crosslinking monomers may be, for example, divinylbenzenes, trivinylbenzenes, 1,2,4-trivinylcyclohexane, 1,5-hexadiene, 1,5,9-decatriene, 1,9-decadiene, 1,5-heptadiene, diallyl phthalates, ethylene glycol dimethacrylate, polyethylene glycol dimethacrylates, penta- and tetraacrylates, triallylpentaerythritols, octaallylsucrose, cyclo-paraffins, cycloolefins and N-methylenebisacrylamide. In one embodiment, the cationic associative polymers are present in an amount ranging from 0.01 to 5% by weight, relative to the total weight of the composition, for example, from 0.05 to 2.5% by weight, and even further, for example, from 0.1 to 1% by weight. The composition disclosed herein additionally comprises at least one dye chosen from oxidation dye precursors and direct dyes. The at least one oxidation dye precursor may be chosen from oxidation bases and couplers. The oxidation bases may be, for example, chosen from the oxidation bases conventionally used for oxidation dyeing, for example, para-phenylenediamines, bisphenylalkylenediamines, para-aminophenols, ortho-aminophenols and heterocyclic bases and their addition salts with an acid or with an alkaline agent. Among the para-phenylenediamines, there may be mentioned, by way of example, para-phenylenediamine, para-tolylenediamine, 2-chloro-para-phenylenediamine, 2,3-dimethyl-para-phenylenediamine, 2,6-dimethyl-para-phenylenediamine, 2,6-diethyl-para-phenylenediamine, 2,5-dimethyl-para-phenylenediamine, N,N-dimethyl-para-phenylenediamine, N,N-diethyl-para-phenylenediamine, N,N-dipropyl-para-phenylenediamine, 4-amino-N,N-diethyl-3-methylaniline, N,N-bis(β-hydroxyethyl)-para-phenylenediamine, 4-N,N-bis(β-hydroxyethyl)amino-2-methylaniline, 4-N,N-bis(β-hydroxy-ethyl)amino-2-chloroaniline, 2-β-hydroxyethyl-para-phenylenediamine, 2-fluoro-para-phenylenediamine, 2-isopropyl-para-phenylenediamine, N-(β-hydroxypropyl)-para-phenylenediamine, 2-hydroxymethyl-para-phenylenediamine, N,N-dimethyl-3-methyl-para-phenylenediamine, N,N-(ethyl-β-hydroxyethyl)-para-phenylenediamine, N-(β,γ-dihydroxypropyl)-para-phenylenediamine, N-(4′-aminophenyl)-para-phenylenediamine, N-phenyl-para-phenylenediamine, 2-β-hydroxyethyloxy-para-phenylenediamine, 2-β-acetylaminoethyloxy-para-phenylenediamine, N-(β-methoxyethyl)-para-phenylenediamine, 4′-aminophenyl-1-(3-hydroxy)pyrrolidine and their addition salts with an acid or with an alkaline agent. The para-phenylenediamines may, for example, be chosen from para-phenylenediamine, para-tolylenediamine, 2-isopropyl-para-phenylenediamine, 2-β-hydroxyethyl-para-phenylenediamine, 2-β-hydroxyethyloxy-para-phenylenediamine, 2,6-dimethyl-para-phenylenediamine, 2,6-diethyl-para-phenylenediamine, 2,3-dimethyl-para-phenylenediamine, N,N-bis(β-hydroxyethyl)-para-phenylenediamine, 2-chloro-para-phenylenediamine, 2-β-acetylaminoethoxy-para-phenylenediamine and their addition salts with an acid or with an alkaline agent. The bisphenylalkylenediamines may be chosen, for example, from N,N′-bis-(β-hydroxyethyl)-N,N′-bis(4′-aminophenyl)-1,3-diaminopropanol, N,N′-bis(β-hydroxyethyl)-N,N′-bis(4′-aminophenyl)ethylenediamine, N,N′-bis(4-aminophenyl)tetramethylenediamine, N,N′-bis(ρ-hydroxyethyl)-N,N′-bis(4-aminophenyl)tetramethylenediamine, N,N′-bis(4-methylaminophenyl)tetramethylenediamine, N,N′-bis(ethyl)-N,N′-bis(4′-amino-3′-methyl-phenyl)ethylenediamine, 1,8-bis(2,5-diaminophenoxy)-3,5-dioxaoctane and their addition salts with an acid or with an alkaline agent. The para-aminophenols may be chosen, for example, from para-aminophenol, 4-amino-3-methylphenol, 4-amino-3-fluorophenol, 4-amino-3-hydroxy-methylphenol, 4-amino-2-methylphenol, 4-amino-2-hydroxymethylphenol, 4-amino-2-methoxymethylphenol, 4-amino-2-aminomethylphenol, 4-amino-2-(β-hydroxy-ethylaminomethyl)phenol, 4-amino-2-fluorophenol and their addition salts with an acid or with an alkaline agent. The ortho-aminophenols may be chosen, for example, from 2-aminophenol, 2-amino-5-methylphenol, 2-amino-6-methylphenol, 5-acetamido-2-aminophenol and their addition salts with an acid or with an alkaline agent. The heterocyclic bases may be chosen, for example, from 2,3-diamino-6-methoxypyridine; pyrimidine derivatives, such as, for example, 2,4,5,6-tetraaminopyrimidine or 4-hydroxy-2,5,6-triaminopyrimidine; and pyrazole derivatives with, for example, 1-N-β-hydroxyethyl-4,5-diaminopyrazole; and their addition salts with an acid or with an alkaline agent. When used, the at least one oxidation base may be present in an amount ranging from 0.0005 to 12% by weight, relative to the total weight of the composition, for example, from 0.005 to 6% by weight, relative to the total weight of the composition. The composition may also comprise, combined with at least one oxidation base, at least one coupler so as to modify or enrich with glints the shades obtained. The at least one coupler may be chosen, for example, from the couplers conventionally used in oxidation dyeing, for example, meta-phenylenediamines, meta-aminophenols, meta-diphenols and heterocyclic couplers and their addition salts with an acid or with an alkaline agent. 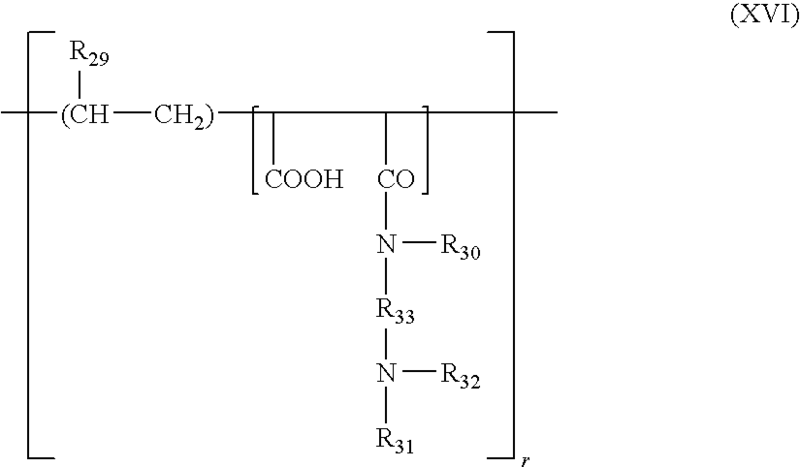 In at least one embodiment, the at least one coupler may be chosen from 2-methyl-5-aminophenol, 5-N-(β-hydroxyethyl)amino-2-methylphenol, 3-aminophenol, 2-methyl-5-amino-6-chlorophenol, 1,3-dihydroxybenzene, 1,3-dihydroxy-2-methylbenzene, 4-chloro-1,3-dihydroxybenzene, 2,4-diamino-1-(β-hydroxyethyloxy)benzene, 2-amino-4-(β-hydroxyethylamino)-1-methoxybenzene, 1,3-diaminobenzene, 1,3-bis(2,4-diaminophenoxy)propane, sesamol, α-naphthol, 6-hydroxyindole, 4-hydroxyindole, 4-hydroxy-N-methylindole, 6-hydroxyindoline, 2-amino-3-hydroxypyridine, 2,6-dihydroxy-4-methylpyridine, 1-H-3-methylpyrazol-5-one, 1-phenyl-3-methylpyrazol-5-one, 2,6-dimethylpyrazolo[1,5-b]-1,2,4-triazole, 2,6-dimethyl[3,2-c]-1,2,4-triazole, 6-methylpyrazolo-[1,5-a]benzimidazole and their addition salts with an acid or with an alkaline agent. When present, the at least one coupler may be present in an amount ranging from 0.0001% to 15% by weight, for example, from 0.005% to 12% by weight, relative to the total weight of the composition. In one embodiment, the at least one coupler may be present in an amount ranging from 0.01% to 10% by weight relative to the total weight of the composition. The addition salts with an acid may be chosen from the hydrochlorides, the hydrobromides, the sulphates, the citrates, the succinates, the tartrates, the tosylates, the benzenesulphonates, the lactates and the acetates. The at least one direct dye may be chosen from nonionic, cationic and anionic dyes. By way of nonlimiting examples, there may be mentioned nitrobenzene dyes, azo, azomethine, methine, tetraazapentamethine, anthraquinone, naphthoquinone, benzoquinone, phenothiazine, indigoid, xanthene, phenanthridine and phthalocyanine dyes, those derived from triarylmethane, and natural dyes, alone or as mixtures. wherein at least one of the radicals Rb, Rc or Ra is chosen from γ-hydroxypropyl radicals and with the proviso that Ra and Rc are not both β-hydroxyethyl radicals when Rb is chosen from γ-hydroxypropyl radicals, such as those described in French Patent No. FR 2 692 572. Among the azo direct dyes which can be used disclosed herein, non-limiting mention may be made of the cationic azo dyes described in International Patent Application Publication Nos. WO 95/15144, WO 95/01772, WO 02/078 660, WO 02/100 834, and WO 02/100 369; European Patent Application No. EP 714 954, French Patent Application Nos. FR 2 822 696, FR 2 825 702, FR 2 825 625, FR 2 822 698, FR 2 822 693, FR 2 822 694, FR 2 829 926, FR 2 807 650, and FR 2 844 269. The following dyes, described in COLOUR INDEX INTERNATIONAL 3rd edition, may also be mentioned, for example, among the azo direct dyes: Disperse Red 17, Acid Yellow 9, Acid Black 1, Basic Red 22, Basic Red 76, Basic Yellow 57, Basic Brown 16, Acid Yellow 36, Acid Orange 7, Acid Red 33, Acid Red 35, Basic Brown 17, Acid Yellow 23, Acid Orange 24, Disperse Black 9. Non-limiting mention may also be made of 1-(4′-aminodiphenylazo)-2-methyl-4bis-(β-hydroxyethyl)aminobenzene and 4-hydroxy-3-(2-methoxyphenylazo)-1-naphthalenesulphonic acid. Among the cationic methine direct dyes, there may also be mentioned, for example, Basic Red 14, Basic Yellow 13 and Basic Yellow 29. The following compounds may be mentioned, for example, among the triarylmethane dyes which can be used as disclosed herein: Basic Green 1, Acid Blue 9, Basic Violet 3, Basic Violet 14, Basic Blue 7, Acid Violet 49, Basic Blue 26, Acid Blue 7. The composition may also comprise natural direct dyes such as lawsone, juglone, alizarin, purpurin, carminic acid, kermesic acid, purpurogallin, procatechaldehyde, indigo, isatin, curcumin, spinulosin and apigenidin. It is also possible to use extracts or decoctions comprising these natural dyes, for example, poultices or extracts based on henna. The at least one direct dye, when present, may be present in an amount ranging from 0.0005% to 15% by weight relative to the weight of the composition, for example, from 0.005% to 12% by weight relative to the total weight of the composition. In one embodiment, the at least one direct dye may be present in an amount ranging from 0.01% to 5% by weight relative to the total weight of the composition. According to one embodiment, the composition further comprises at least one fatty substance. In one embodiment, the at least one fatty substance is chosen from nonoxyalkylenated and nonglycerolated fatty alcohols, nonoxyalkylenated and nonglycerolated fatty acid amides, mono- and polyesters of carboxylic acids, mineral oils, vegetable oils, or mixtures thereof. Among fatty alcohols, non-limiting mention may be made of C8-C30, for example, C10-C24, even further, for example, C12-C24, saturated or unsaturated, linear or branched alcohols optionally comprising at least one other hydroxyl group. By way of example, there may be mentioned, oleyl, lauryl, palmityl, myristyl, behenyl, stearyl, linoleyl, linolenyl, capryl and arachidonyl alcohols, or mixtures thereof. The fatty acid amides may be chosen, for example, from the compounds derived from an alkanolamine and a C8-C30 fatty acid. In an embodiment, they are chosen from amides of a C2-C10 alkanolamine and a C14-C30 fatty acid, for example, from the amides of a C2-C10 alkanolamine and a C14-C22 fatty acid. ricinoleic acid monoethanolamide, such as the amide marketed under the trade name ricinoleic monoethanolamide by the company STEARINERIES DUBOIS. The mono- or polyesters of carboxylic acids, wherein the polyesters are linear or branched, saturated or unsaturated, may, for example, comprise at least one C8-C30, for example, C10-C24, and further, for example, C12-C24, hydrocarbon chain derived from the acid or alcohol part, and at least one C1-C8, for example, C1-C6, chain. Furthermore, if the carboxylic acid comprises several carboxyl functional groups, these may be, for example, all esterified. Finally, in one embodiment the alcohols are chosen from monofunctional alcohols. By way of example, non-limiting mention may be made of the esters of oleic, lauric, palmitic, myristic, behenic, stearic, linoleic, linolenic, capric, and arachidonic acids, or mixtures thereof such as the oleopalmitic, oleostearic and palmitostearic mixtures, and the like. The diisopropyl ester of sebacic acid (diisopropyl sebacate), dioctyl adipate and dicaprylyl maleate may, for example, be mentioned. In one embodiment, the esters are chosen from those obtained from C12-C24 acids, for example, acids chosen from carboxyl groups, and saturated, linear or branched C3-C6 monoalcohols. In one embodiment, the ester is chosen from isopropyl palmitate, and isopropyl myristate, alone or as mixtures. Paraffin oil is an example of a mineral oil which can be used as a fatty substance in the composition. The vegetable oils may, for example, be chosen from avocado oil, olive oil or liquid jojoba wax. In one embodiment, the fatty substance is chosen from oxyalkylenated and nonglycerolated fatty alcohols. In one embodiment, the total content of fatty substance, if present, is present in an amount of no more than 10% by weight of the dye composition. For example, the total content of fatty substance may be present in an amount ranging from 1 to 9% by weight, relative to the total weight of the composition. In one embodiment, the surfactant/fatty substance weight ratio is greater than 1.75. The composition disclosed herein may additionally comprise at least one alkalinizing agent. 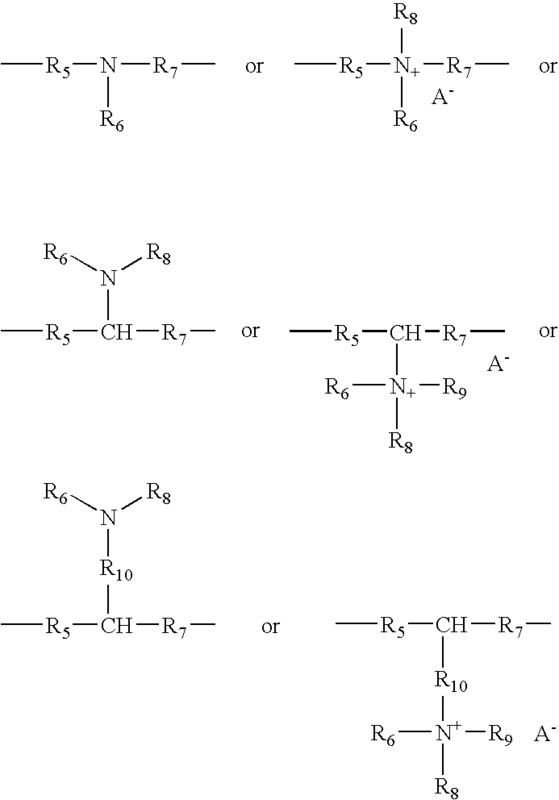 wherein R is a propylene residue optionally substituted with a hydroxyl group or a C1-C4 alkyl radical; R38, R39, R40 and R41, which may be identical or different, are each chosen from hydrogen atoms, C1-C4 alkyls and C1-C4 hydroxyalkyl radicals. In one embodiment, the alkalinizing agent may be chosen from aqueous ammonia, alkanolamines, and combinations of alkanolamines with alkali metal or alkaline-earth metal silicates. In another embodiment, the composition does not comprise aqueous ammonia as the alkalinizing agent. The pH of the disclosed composition may, for example, be adjusted using acidifying agents, such as inorganic or organic acids such as hydrochloric acid, orthophosphoric acid, sulphuric acid, carboxylic acids such as acetic acid, tartaric acid, citric acid, lactic acid and sulphonic acids. For example, the content of basifying and/or acidifying agent is such that the pH of the dye composition ranges from 3 to 12, for example from 4 to 11 and, further for example, from 7 to 11. The composition disclosed herein may also comprise at least one cationic or amphoteric substantive polymer. As used herein, the expression “cationic polymer” means any polymer comprising cationic groups and/or groups which can be ionized to cationic groups. In one embodiment, the at least one cationic polymer may be chosen from those already known per se as improving the cosmetic properties of the hair, for example, those described in European Patent Application No. EP-A-337 354 and in French Patent Nos. FR-2 270 846, 2 383 660, 2 598 611, 2 470 596 and 2 519 863. The at least one cationic polymer may be chosen from those which comprise units comprising primary, secondary, tertiary and/or quaternary amine groups which may either form part of the main polymer chain, or be carried by a side substituent directly attached thereto. The cationic polymers used may, for example, have a number-average molecular mass ranging from 500 to 5×106, for example, from 103 to 3×106. Among the cationic polymers, there may be mentioned, for example, the polymers of the polyamine, polyamino amide and polyquaternary ammonium type, for example, described in French Patent Nos. 2 505 384 or 2 542 997. X is an anion derived from an inorganic or organic acid, such as a methosulfate anion or a halide such as chloride or bromide. The polymers of the family (1) may comprise, for example, at least one unit derived from comonomers which may be chosen from the family of acrylamides, methacrylamides, diacetone acrylamides, acrylamides and methacrylamides substituted on the nitrogen with lower (C1-C4)alkyls, acrylic or methacrylic acids or esters thereof, vinyllactams such as vinylpyrrolidone or vinylcaprolactam, vinyl esters. and the quaternized vinylpyrrolidone/dimethyl-aminopropyl methacrylamide copolymers such as the product sold under the name “GAFQUAT HS 100” by the company ISP. 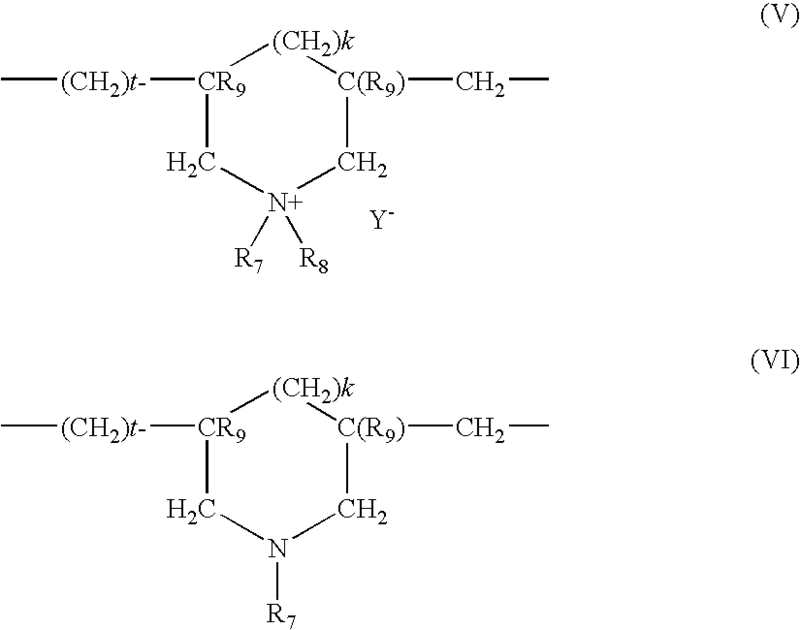 (2) The cellulose ether derivatives comprising quaternary ammonium groups, described in French Patent No. 1,492,597, and, for example, the polymers marketed under the names “JR” (JR 400, JR 125, JR 30M) or “LR” (LR 400, LR 30M) by the company Union Carbide Corporation. These polymers are also defined in the CTFA dictionary as hydroxyethyl cellulose quaternary ammoniums which have reacted with an epoxide substituted by a trimethylammonium group. (3) Cationic cellulose derivatives such as cellulose copolymers or cellulose derivatives grafted with a quaternary ammonium water-soluble monomer, and described, for example, in U.S. Pat. No. 4,131,576, such as hydroxyalkyl celluloses like hydroxymethyl, hydroxyethyl or hydroxypropyl celluloses grafted, for example, with a methacryloylethyltrimethylammonium, methacrylamidopropyltrimethylammonium or dimethyldiallylammonium salt. The commercialized products corresponding to this definition are, for example, the products sold under the name “Celquat L 200” and “Celquat H 100” by the company National Starch. (4) The cationic guar gums described, for example, in U.S. Pat. Nos. 3,589,578 and 4,031,307 such as guar gums comprising cationic trialkylammonium groups. Guar gums modified with a 2,3-epoxypropyltri-methylammonium salt (e.g. chloride) are for example used. Such products are marketed, for example, under the trade names JAGUAR C13 S, JAGUAR C 15, JAGUAR C 17 or JAGUAR C162 by the company MEYHALL. (5) Polymers comprising piperazinyl units and of alkylene or hydroxyalkylene divalent radicals with straight or branched chains, optionally interrupted by oxygen, sulphur or nitrogen atoms or by aromatic or heterocyclic rings, as well as the oxidation and/or quaternization products of these polymers. Such polymers are described, for example, in French Patent Nos. 2,162,025 and 2,280,361. (6) Water-soluble polyaminoamides prepared, for example, by polycondensation of an acid compound with a polyamine; these polyaminoamides may be crosslinked with an epihalohydrin, a diepoxide, a dianhydride, an unsaturated dianhydride, a bis-unsaturated derivative, a bishalohydrin, a bisazetidinium, a bishaloacyldiamine, an alkylbishalide or else with an oligomer resulting from the reaction of a difunctional compound which is reactive towards a bishalohydrin, a bisazetidinium, a bishaloacyidiamine, an alkylbishalide, an epihalohydrin, a diepoxide or a bis-unsaturated derivative; the crosslinking agent being employed in proportions ranging from 0.025 to 0.35 mol per amine group of the polyaminoamide; these polyaminoamides may be alkylated or, if they include at least one tertiary amine functional group, quaternized. Such polymers are described, for example, in French Patents 2,252,840 and 2,368,508. (7) Polyaminoamide derivatives resulting from the condensation of polyalkylenepolyamines with polycarboxylic acids, followed by an alkylation with difunctional agents. There may be mentioned, for example, the adipic acid-dialkylaminohydroxy-alkyldialkylenetriamine polymers wherein the alkyl radical comprises from 1 to 4 carbon atoms and may be, for example, chosen from methyl, ethyl or propyl. Such polymers are described, for example, in French Patent No. 1,583,363. Among these derivatives there may be mentioned, for example, the adipic acid/dimethyl-aminohydroxypropyl/diethylenetriamine polymers sold under the name “Cartaretine F, F4 or F8” by the company Sandoz. (8) Polymers obtained by reaction of a polyalkylenepolyamine comprising two primary amine groups and at least one secondary amine group with a dicarboxylic acid chosen from diglycolic acid and saturated aliphatic dicarboxylic acids comprising from 3 to 8 carbon atoms. The molar ratio of the polyalkylenepolyamine to the dicarboxylic acid being between 0.8:1 and 1.4:1; the polyaminoamide resulting therefrom being made to react with epichlorohydrin in a molar ratio of epichlorohydrin relative to the secondary amine group of the polyaminoamide of between 0.5:1 and 1.8:1. Such polymers are described, for example, in U.S. Pat. Nos. 3,227,615 and 2,961,347. Polymers of this type are marketed, for example, under the name “Hercosett 57” by the company Hercules Inc. or else under the name of “PD 170” or “Delsette 101” by the company Hercules in the case of the copolymer of adipic acid/epoxypropyl/diethylene-triamine. For example, R7 and R8, which may be the same or different, are each chosen from alkyl groups having from 1 to 4 carbon atoms; Y− is chosen from an anion such as bromide, chloride, acetate, borate, citrate, tartrate, bisulfate, bisulfite, sulfate or phosphate. These polymers are described, for example, in French Patent No. 2 080 759 and in its Certificate of Addition 2 190 406. Among the polymers defined above there may be mentioned, for example, the dimethyldiallylammonium chloride homopolymer sold under the name “Merquat 100” by the company Calgon (and its homologues of low weight-average molecular mass) and the copolymers of diallyl-dimethylammonium chloride and acrylamide marketed under the name “MERQUAT 550”. For example, X− is chosen from anions such as chloride or bromide. These polymers may, for example, have a number-average molecular mass ranging from 1,000 to 100,000. Polymers of this type are described, for example, in French Patent Nos. 2,320,330, 2,270,846, 2,316,271, 2,336,434 and 2,413,907 and U.S. Pat. Nos. 2,273,780, 2,375,853, 2,388,614, 2,454,547, 3,206,462, 2,261,002, 2,271,378, 3,874,870, 4,001,432, 3,929,990, 3,966,904, 4,005,193, 4,025,617, 4,025,627, 4,025,653, 4,026,945 and 4,027,020. 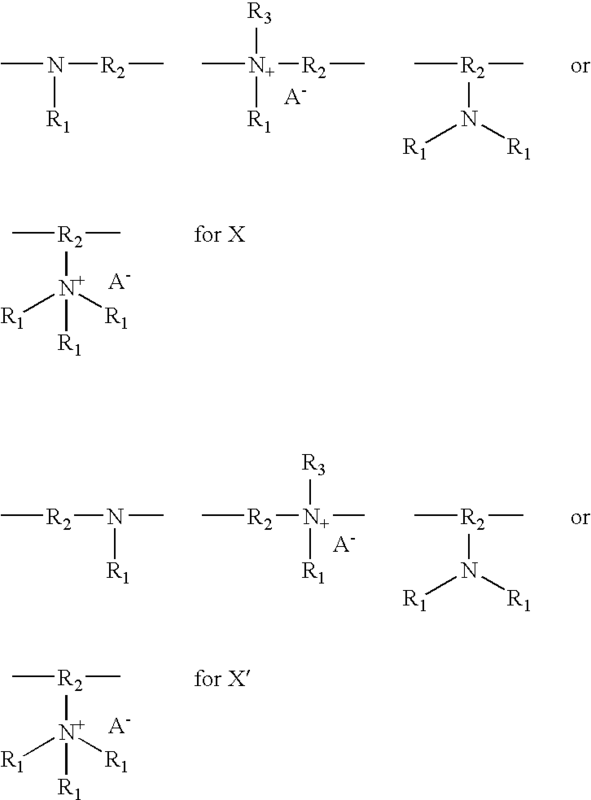 R10, R11, R12 and R13, which may be identical or different, are each chosen from alkyl or hydroxyalkyl radicals having from 1 to 4 carbon atoms, n and p are chosen from integers ranging from 2 to 20 and X− is chosen from an anion derived from an inorganic or organic acid. wherein p is chosen from an integer ranging from 1 to 6, D may be a bond or a group—(CH2)r—CO— wherein r is chosen from number equal to 4 or to 7, X− is an anion. Such polymers may be prepared according to the methods described in U.S. Pat. Nos. 4,157,388, 4,702,906, 4,719,282. They are, for example, described in European Patent Application No. EP-A-122 324. Among these, there may be mentioned, for example the products “Mirapol A 15”, “Mirapol AD1”, “Mirapol AZ1” and Mirapol 175” sold by the company Miranol. (12) Quaternary vinylpyrrolidone and vinylimidazole polymers such as, for example, the products marketed under the names Luviquat FC 905, FC 550 and FC 370 by the company B.A.S.F. (14) The crosslinked polymers of methacryloyloxy(C1-C4 alkyl)tri(C1-C4 alkyl)ammonium salts such as the polymers obtained by homopolymerization of dimethylaminoethyl methacrylate quaternized with methyl chloride, or by copolymerization of acrylamide with dimethylaminoethyl methacrylate quaternized with methyl chloride, the homo- or copolymerization being followed by crosslinking with a compound comprising olefinic unsaturation, for example, methylenebisacrylamide. For example, it is possible to employ a crosslinked acrylamide/methacryloyloxyethyltrimethylammonium chloride copolymer (20/80 by weight) in the form of a dispersion comprising 50% by weight of said copolymer in mineral oil. This dispersion is marketed under the name of “SALCARE® SC 92” by the company ALLIED COLLOIDS. It is also possible to employ a crosslinked methacryloyloxyethyltrimethylammonium chloride homopolymer comprising approximately 50% by weight of the homopolymer in mineral oil or in a liquid ester. These dispersions are marketed under the names of “SALCARE® SC 95” and “SALCARE® SC 96” by the company ALLIED COLLOIDS. (15) Other cationic polymers useful herein are are polyalkyleneimines, for example, polyethyleneimines, polymers comprising vinylpyridine or vinylpyridinium units, condensates of polyamines and of epichlorohydrin, quaternary polyureylenes and chitin derivatives. and, for example, those whose molecular weight, determined by gel permeation chromatography, is about 1200. K and M may also be chosen from cationic polymer chains comprising primary, secondary, tertiary or quaternary amine groups, wherein at least one of the amine groups carries a carboxylic or sulphonic group linked via a hydrocarbon radical or alternatively K and M form part of a chain of a polymer with an α,β-dicarboxylic ethylene unit wherein one of the carboxylic groups has been caused to react with a polyamine comprising at least one primary or secondary amine group. (1) The polymers resulting from the copolymerization of a monomer derived from a vinyl compound carrying a carboxylic group such as acrylic acid, methacrylic acid, maleic acid, alpha-chloroacrylic acid, and of a basic monomer derived from a substituted vinyl compound comprising at least one basic atom such as dialkylaminoalkyl methacrylate and acrylate, dialkylaminoalkylmethacrylamide and acrylamide. Such compounds are described in U.S. Pat. No. 3,836,537. Non-limiting mention may also be made of the sodium acrylate/acrylamidopropyltrimethylammonium chloride copolymer sold under the name POLYQUART KE 3033 by the company HENKEL. The vinyl compound may also be a dialkyldiallylammonium salt such as dimethyldiallylammonium chloride. The copolymers of acrylic acid and of the latter monomer are offered under the names MERQUAT 280, MERQUAT 295 and MERQUAT PLUS 3330 by the company CALGON. The N-substituted acrylamides or methacrylamides which may be mentioned, for example, comprise from 2 to 12 carbon atoms, for example, N-ethylacrylamide, N-tert-butylacrylamide, N-tert-octylacrylamide, N-octylacrylamide, N-decylacrylamide, N-dodecylacrylamide as well as the corresponding methacrylamides. The acidic comonomers are chosen, for example, from acrylic, methacrylic, crotonic, itaconic, maleic and fumaric acids as well as the alkyl monoesters having 1 to 4 carbon atoms of maleic or fumaric anhydrides or acids. The copolymers whose CTFA name (4th ed. 1991) is Octylacrylamide/acrylates/butylaminoethylmethacrylate copolymer such as the products sold under the name AMPHOMER or LOVOCRYL 47 by the company NATIONAL STARCH may be used. 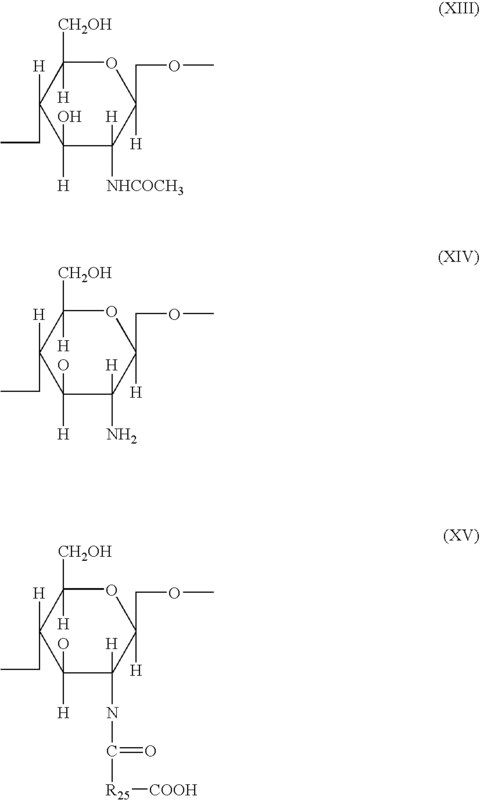 c) in an amount of 0 to 20 mol %, the radical —NH—(CH2)6—NH— which is derived from hexamethylenediamine, these polyaminoamines being crosslinked by adding a bifunctional crosslinking agent chosen from the epihalohydrins, diepoxides, dianhydrides, bis-unsaturated derivatives, by means of 0.025 to 0.35 mol of crosslinking agent per amine group of the polyaminoamide and alkylated by the action of acrylic acid, chloroacetic acid or of an alkanesultone or of their salts. The saturated carboxylic acids may be, for example, chosen from the acids having 6 to 10 carbon atoms such as adipic, 2,2,4-trimethyladipic and 2,4,4-trimethyladipic acid, terephthalic acid, the acids with an ethylenic double bond such as for example acrylic, methacrylic and itaconic acids. The alkanesultones used in the alkylation may be, for example, propane or butanesultone, the salts of the alkylating agents may be, for example, the sodium or potassium salts. —R23 and R24, which may be identical or different, are each chosen from hydrogen atoms and alkyl radicals such that the sum of the carbon atoms in R23 and R24 does not exceed 10. Non-limiting mention may be made of the copolymer of methyl methacrylate/methyl dimethylcarboxymethylammonioethyl methacrylate such as the product sold under the name DIAFORMER Z301 by the company SANDOZ. alkylthio residues wherein the alkyl group bears an amino residue, wherein at least one of the radicals R26, R27 and R28 is chosen from a hydrogen atom; or, if q is 1, R26, R27 and R28 are each a hydrogen atom, and also the salts formed by these compounds with bases or acids. (6) The polymers derived from the N-carboxyalkylation of chitosan such as N-carboxymethyl chitosan or N-carboxybutyl chitosan sold under the name “EVALSAN” by the company JAN DEKKER. R31 having the meanings mentioned above, and r is a number greater than 1. and also the higher homologues of these radicals and comprising up to 6 carbon atoms. and X is chosen from E and E′ and at least once, E′; E having the meaning indicated above and E′ is a bivalent radical which is an alkylene radical with a linear or branched chain having up to 7 carbon atoms in the principal chain, which is unsubstituted or substituted with at least one hydroxyl radical and comprising at least one nitrogen atom, the nitrogen atom being substituted with an alkyl chain optionally interrupted by an oxygen atom and necessarily comprising at least one carboxyl functional group or at least one hydroxyl functional group and betainized by reaction with chloroacetic acid or sodium chloroacetate. (9) The copolymers (C1-C5)alkyl vinyl ether/maleic anhydride partially modified by semiamidation with an N,N-dialkylaminoalkylamine such as N,N-dimethylaminopropylamine or by semiesterification with an N,N-dialkanolamine. These copolymers may also comprise other vinyl comonomers such as vinylcaprolactam. In one embodiment, the amphoteric polymers used are those of family (1). In at least one embodiment, the at least one cationic or amphoteric substantive polymer, are present in an amount ranging from 0.01% to 10% by weight relative to the total weight of the composition, for example, from 0.05% to 5% by weight, such as from 0.1% to 3% by weight, relative to the total weight of the composition. The appropriate medium for dyeing keratin fibers used herein comprises water or a mixture of water and at least one organic solvent to solubilize the compounds which might not be sufficiently soluble in water. By way of organic solvent, there may for example be mentioned lower C1-C4 alkanols such as ethanol and isopropanol; polyols and polyol ethers such as 2-butoxyethyl, propylene glycol, propylene glycol monomethyl ether, diethylene glycol monoethyl ether and monomethyl ether, and aromatic alcohols such as benzyl alcohol or phenoxyethanol, and mixtures thereof. The solvents may be present in amounts ranging from 1% to 40% by weight, for example, from 5% to 30% by weight, relative to the total weight of the composition. The composition may also comprise customary additives in the field such as organic or inorganic thickeners; antioxidants; penetrating agents; sequestering agents; perfumes; buffers; dispersing agents; conditioners different from the cationic or amphoteric substantive polymers such as for example cations, modified or unmodified, volatile or nonvolatile silicones; film-forming agents; ceramides; preservatives; stabilizers; opacifying agents. Persons skilled in the art will be careful to choose this or these optional additional compounds such that the advantageous properties intrinsically attached to the composition disclosed herein are not, or not substantially impaired by the addition(s) envisaged. Also disclosed herein is a process for dyeing keratin materials using the composition disclosed herein. According to one embodiment, the process comprises applying the composition in the absence of an oxidizing agent to keratin materials, for example, fibers, dry or wet, with or without final rinsing of the composition. In the case of this embodiment, the composition disclosed herein does not comprise an oxidation dye precursor, but only at least one direct dye. In another embodiment, the process comprises applying the composition disclosed herein, in the presence of an oxidizing agent, to the keratin materials, dry or wet, and then in leaving in for a sufficient period to obtain the desired color. According to another embodiment, at least one dye composition disclosed herein and an oxidizing composition are applied to said keratin fibers simultaneously or successively without intermediate rinsing. In at least one embodiment, the composition applied is a “ready-to-use composition,” that is to say a composition obtained by freshly mixing at least one dye composition disclosed herein with a composition comprising at least one oxidizing agent. In this case, the dye composition may comprise at least one oxidation dye precursor. It may also comprise at least one direct dye, in the case where lightening of the keratin fibers is desired in combination with the coloration. For example, the dye composition may comprise a combination of oxidation dye precursors and direct dyes. The oxidizing agent present in the oxidizing composition may be chosen for example from hydrogen peroxide, urea peroxide, alkali metal bromates, persalts such as perborates and persulphates, and enzymes such as peroxydases or oxidoreductases comprising two or four electrons. In one embodiment, the oxidizing agent is hydrogen peroxide. The oxidizing agent may be present in an amount ranging from 1% to 40% by weight, relative to the total weight of the ready-to-use composition, for example, from 1% to 20% by weight, relative to the total weight of the ready-to-use composition. In one embodiment, the oxidizing composition used is an aqueous composition and is in the form of a solution or of an emulsion. In another embodiment, the composition is mixed, free of oxidizing agent, with 0.5 to 10 equivalents by weight of the oxidizing composition. It should be noted that the pH of the ready-to-use composition may range, for example, from 3 to 12, for example, from 4 to 11 and further, for example, from 6.5 to 10.5. The pH of the ready-to-use composition may be adjusted by means of an alkalinizing or acidifying agent chosen, for example, from those mentioned above. Where the composition is applied in the presence of an oxidizing agent, for example, the process may comprise a preliminary step comprising separately storing the at least one dye composition disclosed herein and a composition comprising at least one oxidizing agent in a medium that is suitable for dyeing human keratin fibers, and then mixing them together at the time of use, before applying this mixture to the wet or dry keratin materials. Regardless of the presence or absence of oxidizing agent, the time required to develop the coloration ranges from a few seconds to 60 minutes, for example, from 1 to 50 minutes. The temperature required to develop the coloration ranges from room temperature (15 to 25° C.) to 250° C., for example, from room temperature to 180° C. and further, for example, from room temperature to 60° C.
Once the time required to develop the coloration has elapsed, the composition may be, in at least some embodiments, removed. Removal may take place in a conventional manner, either by carrying out at least one rinse, or by carrying out at least one washes and rinses, or by carrying out a combination thereof. Finally, the keratin materials may be dried or are left to dry. Other than in the examples, or where otherwise disclosed, all numbers expressing quantities of ingredients, reaction conditions, and so forth used in the specification and claims are to be understood as being modified in all instances by the term “about.” Accordingly, unless indicated to the contrary, the numerical parameters set forth in the following specification and attached claims are approximations that may vary depending upon the desired properties sought to be obtained by the embodiments disclosed herein. At the very least, and not as an attempt to limit the application of the doctrine of equivalents to the scope of the claims, each numerical parameter should be construed in light of the number of significant digits and ordinary rounding approaches. Notwithstanding that the numerical ranges and parameters setting forth the broad scope of the disclosed embodiments are approximations, unless otherwise indicated the numerical values set forth in the specific examples are reported as precisely as possible. Any numerical value, however, inherently comprises certain errors necessarily resulting from the standard deviation found in their respective testing measurements. The embodiments disclosed herein are illustrated in greater detail by the non-limiting example described below. The dye composition A was stable during storage. The dye composition A was mixed, at the time of use, in a plastic bowl and for 2 minutes, with an aqueous oxidizing composition comprising 6% hydrogen peroxide, in an amount of 1 part of dye composition per 1.5 parts of oxidizing composition. The mixing was easy and rapid. The mixture obtained was applied to locks of natural hair which were 90% white and was left in for 20 minutes. The application was easy and rapid. The product became perfectly localized, did not run, and spread well from the root to the end. The locks were then rinsed with water, they were washed with standard shampoo, again rinsed with water and then dried and disentangled. The mixture was easy to remove on rinsing. The hair was dyed in an intense red copper shade. Furthermore, the hair was not rough. wherein the surfactant/fatty substance weight ratio is greater than 1.75. 2. A dye composition according to claim 1, wherein the dye composition comprises water in an amount greater than or equal to 45% by weight, relative to the total weight of the composition. 3. A dye composition according to claim 1, wherein the dye composition comprises water in an amount greater than or equal to 50% by weight, relative to the total weight of the composition. copolymers of propylene and ethylene oxide. 5. A dye composition according to claim 4, wherein the at least one amine oxide is chosen from (C10-C14)alkylamine oxides and N-acylaminopropylmorpholine oxides. 6. A dye composition according to claim 1, wherein the at least one nonionic surfactant is chosen from oxyalkylenated fatty alcohols and glycerolated fatty alcohols. salts of polyoxyalkylenated (C6-C30)alkyl ether carboxylic acids, of polyoxyalkylenated (C6-C30)alkyl aryl ether carboxylic acids and of polyoxyalkylenated (C6-C30)alkyl amidoether carboxylic acids. 8. A dye composition according to claim 1, wherein the at least one surfactant chosen from nonionic surfactants and anionic surfactants is present in an amount ranging from 0.01% to 40% by weight, relative to the total weight of the composition. 9. A dye composition according to claim 1, wherein the at least one modified nonionic cellulose is chosen from hydroxy(C2-C3)alkylcelluloses comprising at least one saturated or unsaturated, linear or branched C6-C30 hydrocarbon chain. 10. A dye composition according to claim 1, wherein the at least one modified nonionic cellulose is present in an amount ranging from 0.01% to 5% by weight, relative to the total weight of the composition. 11. A dye composition according to claim 1, wherein the at least one cationic associative polymer is chosen from quaternized cellulose derivatives, cationic polyurethanes, cationic polyvinyllactams and cationic acrylic terpolymers. 12. A dye composition according to claim 1, wherein the at least one cationic associative polymer is present in an amount ranging from 0.01 to 5% by weight, relative to the weight of the composition. 13. A dye composition according to claim 1, wherein the at least one oxidation dye precursor is chosen from oxidation bases and couplers. 14. A dye composition according to claim 13, wherein the at least one oxidation base is present in an amount ranging from 0.0005 to 12% by weight, relative to the total weight of the composition. 15. A dye composition according to claim 13, wherein the at least one coupler is present in an amount ranging from 0.0001 to 15% by weight, relative to the total weight of the composition. 16. A dye composition according to claim 1, wherein the at least one direct dye is present in an amount ranging from 0.0005 to 15% by weight, relative to the total weight of the composition. 17. A dye composition according to claim 1, wherein the composition further comprises at least one substantive polymer chosen from cationic and amphoteric substantive polymers. 18. A dye composition according to claim 17, wherein the at least one substantive polymer chosen from cationic and amphoteric substantive polymers is present in an amount ranging from 0.01% to 10% by weight, relative to the total weight of the composition. 19. A dye composition according to claim 1, wherein the composition further comprises at least one alkalinizing agent. 20. A dye composition according to claim 19, wherein the at least one alkalinizing agent is chosen from aqueous ammonia, alkanolamines and combinations of C2-C10 alkanolamines with alkali metal or alkaline-earth metal silicates. 21. A dye composition according to claim 1, wherein the at least one fatty substance is chosen from fatty alcohols, fatty acid amides, mono- and polyesters of carboxylic acids, mineral oils, and vegetable oils. 22. A dye composition according to claim 1, wherein the at least one fatty substance is present in an amount of less than or equal to 10% by weight, relative to the total weight of the composition. 23. A dye composition according to claim 1, wherein the composition further comprises at least one oxidizing agent. at least one second compartment comprising an oxidizing composition comprising at least one oxidizing agent. FR2954127B1 (en) * 2009-12-22 2015-10-30 Oreal coloring agent and / or bleaching keratin fibers in two parts, comprising a fatty substance and a sequestering agent. Bruin "Hydrophobically Modified Cellulose Ether for Personal Care." SOFW-Journal Seifen, Oele, Fette, Wachse, Verlag fur Chemische Industri, Augsburg, DE, vol. 120, No. 15, Nov. 30, 1994, pp. 944-946, 948, XP000483287, ISSN: 0942-7694. Copending U.S. Appl. No. 11/393,694, filed Mar. 31, 2006. Copending U.S. Appl. No. 11/393,696, filed Mar. 31, 2006. Copending U.S. Appl. No. 11/393,698, filed Mar. 31, 2006. Copending U.S. Appl. No. 11/393,700, filed Mar. 31, 2006. Copending U.S. Appl. No. 11/393,701, filed Mar. 31, 2006. English language abstract of non-English document EP 0 080 976, (Jun. 1983). English language Derwent Abstract of DE 101 32 915, dated Jan. 31, 2003. English language Derwent Abstract of DE 30 30 119, dated Nov. 19, 1987. English language Derwent Abstract of DE 38 34 142, dated Apr. 12, 1990. English language Derwent Abstract of DE 41 03 292, dated Feb. 10, 1994. English language Derwent Abstract of DE 41 27 230, dated Feb. 18, 1993. English language Derwent Abstract of EP 1 048 289, dated Nov. 2, 2000. English language Derwent Abstract of EP 1 518 547, dated Mar. 30, 2005. European Search Report for EP 06 11 1856 (European counterpart application to U.S. Appl. No. 11/394,234, the present application), dated Jul. 19, 2006. European Search Report for EP 06 11 1858 (corresponding European counterpart application to U.S. Appl. No. 11/393,698, dated Jul. 19, 2006, Examiner Loloiu. European Search Report for EP 06 11 1860 (corresponding European counterpart applciation to U.S. Appl. No. 11/393,701, dated Jul. 18, 2006, Examiner Loloiu. European Search Report for EP 06111861.8 (corresponding European counterpart application to U.S. Appl. No. 11/393,694, dated Jun. 14, 2006, Examiner Loloiu. French Search Report for FR 05/50835 for U.S. Appl. No. 11/393,700, dated Nov. 3, 2005, Examiner Loloiu. French Search Report for FR 05/50837 for U.S. Appl. No. 11/393,694, dated Nov. 10, 2005, Examiner Loloiu. French Search Report for FR 05/50838 for U.S. Appl. No. 11/393,698, dated Nov. 4, 2005, Examiner Loloiu. French Search Report for FR 05/50839 for U.S. Appl. No. 11/393,701, dated Nov. 9, 2005, Examiner Loloiu. French Search Report for FR 05/50841 for U.S. Appl. No. 11/393,696, dated Feb. 14, 2006, Examiner Loloiu. French Search Report for FR 0550842 (Priority Application for U.S. Appl. No. 11/394,234, the present application), dated Feb. 15, 2006. Office Action mailed Jan. 7, 2008, in co-pending U.S. Appl. No. 11/393,694, Examiner E. Elhilo. Office Action mailed Jan. 7, 2008, in co-pending U.S. Appl. No. 11/393,696, Examiner E. Elhilo. Office Action mailed Jan. 7, 2008, in co-pending U.S. Appl. No. 11/393,698, Examiner E. Elhilo. Office Action mailed Jan. 7, 2008, in co-pending U.S. Appl. No. 11/393,700, Examiner E. Elhilo. Office Action mailed Jan. 7, 2008, in co-pending U.S. Appl. No. 11/393,701, Examiner E. Elhilo. Office Action mailed Jun. 13, 2008, in co-pending U.S. Appl. No. 11/393,698, Examiner E. Elhilo. Office Action mailed Jun. 18, 2008, in co-pending U.S. Appl. No. 11/393,700, Examiner E. Elhilo. Office Action mailed Jun. 23, 2008, in co-pending U.S. Appl. No. 11/393,694, Examiner E. Elhilo. Office Action mailed Jun. 27, 2008, in co-pending U.S. Appl. No. 11/393,701, Examiner E. Elhilo. Office Action mailed Oct. 22, 2008, in co-pending U.S. Appl. No. 11/393,698, Examiner E. Elhilo.